Hello! In this blog you'll get to read some of the theory underpinning The Inner Critic Inquiry as well as detailed instructions about how to safely explore your own Inner Critic. Enjoy! Its week three of my 8-week Inner Critic Inquiry course and it just so happens to be Samhain (pronounced sah-ween), the pagan solstice festival, marking the end of the harvest and the beginning of the darkest part of the year to come. Samhain is said to be a time when the veil between our world and the world of the spirits is at it’s thinnest, making it a good time to ease the passage of the souls of the dead from this world into the next. It’s also a time when opportunist ghosts and ghouls pop in for a visit from the other side. In pagan times, during Samhain, people would light fires and send wishes for the onward journeys of their dearly departed, whilst also leaving offers of sweet treats to appease the demons, a ritual which still exists in today’s Halloween celebrations, but with the extra development of now dressing up as the scary monsters, knocking on doors and demanding sugary goodies from strangers. Halloween is the one time of year when it’s completely normal to embrace the dark side of humanity; we flirt with death and dance with the devil and inso doing we open our hearts to the darkness that surrounds us and lives within us, as the shadow. The theory goes, that when we are not willing to embrace all the parts of ourselves, we will find ourselves splitting parts of ourselves off. These parts, if left unacknowledged in the unconscious, will grow into monstrous forces, manifesting internally, as harmful inner voices (i.e the Inner Critic), or externally, as projections. Projecting is a thing we naturally do when there’s part of ourselves we can’t own. Instead, we place all that is bad, ugly and evil, onto other individuals or groups of people. Our society pedals a ridiculous notion of the existence of absolutes; black and white, right and wrong, good and bad. To support this, we are forever selecting new scapegoats to punish, so that we can feel righteous and like our energy is being well spent on eradicating evil. Once upon a time the target of hate / fear was women (well what do you know, sometimes it still is), it’s been gay people, black people, people from other cultures and religions. Right now it’s Muslims, but who knows who it’ll be next week? As long as we are putting our energy into eradicating the enemy, we are blind to our own personal imbalance. As long as we are blaming others, we are not taking responsibility for our own shadows. We all have a shadow. It’s a natural part of being human. Light casts a shadow via every object it shines on. Were we to regularly embrace our own shadows, like we do at Halloween, we might not need to fear the dark parts of ourselves so much. We might not need to project our shadows outwards quite so much; we might be able to see that far from being evil baddies, most people are simply trying their best to get by and to meet their needs in the ways they know how. We might be able to see that often, this week’s hated ones are merely a symbol of our unresolved discord within. So while the veil is thin and the ghosts abound, I invite you to embrace your shadow. Attend to the part of you that never gets a look in. Do it safely, do it creatively, do it with consciousness, do it without harming yourself or anyone else, but find a way to honour the shadow part of yourself. 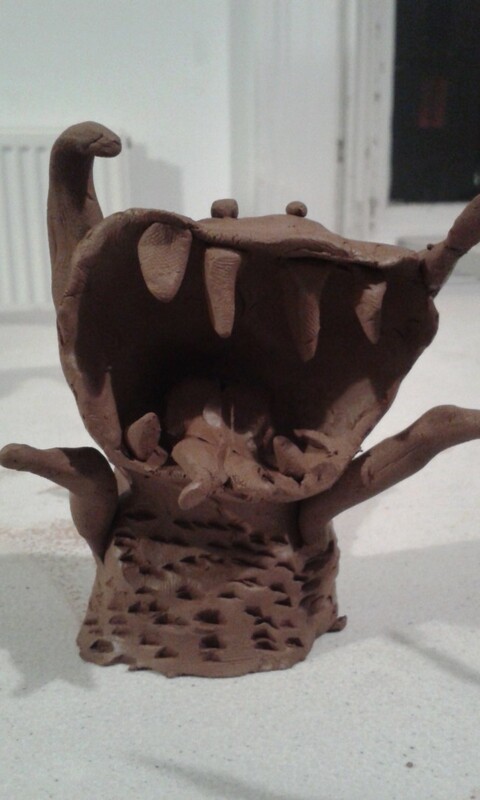 This week in the Inner Critic Inquiry, the participants made clay sculptures of their critics, imagining them as creatures rather than people (I find this safer and less likely to trigger trauma). You can use any creative medium of your choice, you could use clay, plasticine, pastils, felt tip pens, collage, or whatever you like. Set up your art materials before you start the next bit. -sit down, feel the ground beneath you, feel your breath in your belly, have a little check in with yourself - how are you right now? -If at any point you feel overwhelmed, you can come back to the ground or to your breath in your belly to anchor yourself back in the present. -run your mind back through the last week. Were there any points during the week when your inner critic made an appearance? Choose one moment. -Take yourself back to the memory and replay it. Where were you? Who were you with? What was being said / done? How were you feeling? -chose a few critic phrases and repeat them over and over in your critic’s voice. -what’s it like? Does it have feathers, scales, fur, claws, legs? How many legs? Wings? What’s it’s face like? What’s it’s eyes like? How about it’s mouth? What size is it? How is it sitting? -what is it’s home like? -Once you’ve got a clear picture of your critic, reach in and take it out of your body and put it on the ground. -watch it move through the room, how does it travel? does it scuttle, slither, slide, fly? When it reaches it’s full height, how big is it? -come back to the ground beneath you, come back to the breath in your body, come back to the room you’re in, take a look around at the familiar things, touch something soft, something shiny, something warm to bring you back to the here and now. Take 20 or so minutes to create a visual image of your critic using whatever art materials you’ve gathered. Stay close to your experience while you’re making it. Notice your body sensations, emotions and thoughts. When it’s finished, take a good look at it, feel what you feel. Place it somewhere where you’ll be able to see it for at least a day and a night. You can make an altar for it if you like. Keep coming back to it, noticing your feelings each time. You might want to log your changing thoughts and feelings. Your curiosity is a vehicle for change. After 24 Hours, you can make a choice to keep displaying it or to set it free. When I once ran my course near a park, many of the participants left their critics in the trees, some took theirs home and put them in their gardens, so they could watch them gradually de-compose. Follow your instinct, do what feels right. Next week in The Inner Critic Inquiry, the participants will enter into dialogue with their critics, to find out what the critics are trying to protect them from. The theory being that curious inquiry leads the way to creating a new relationship with the critic. If you want to follow the progress of this course, the next blog is all about self care, with 3 simple things you can do anywhere. And if you'd like to read even more, the next blog is about Boundaries. Holly Stoppit is a facilitator, director and dramatherapist, find out more about her here. If you're interested in attending this course in the future, sign up to the mailing list at the bottom of this page.